On Saturday morning, the Egyptian Muslim Brotherhood held a news conference in which its leader, Muhammad Badie, insisted that the so-called opposition in Egypt is nothing more than criminals and saboteurs and condemned the security forces for allowing the burning of Muslim Brotherhood HQ in Cairo. He complained that an attempt had been made to burn the offices of the newspaper of the ruling Freedom and Justice Party (the civil wing of the Muslim Brotherhood). He read out the names of the Muslim Brothers he said were killed in the clashes between the Brotherhood and the opposition. On Friday, Leftist and liberal youth had riposted at the presidential palace in Heliopolis, coming back in tens of thousands to the square in front of the presidential place in Heliopolis. They broke through barbed wire, and the police appear to have let them do so. 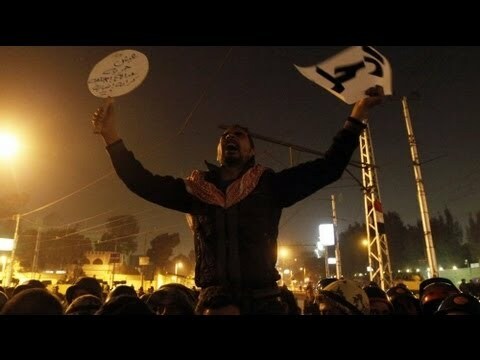 They returned after having been expelled from the area by Muslim Brotherhood cadres on Wednesday. The general unwillingness of many of the police and army to intervene actively in favor of President Morsi appears to have put a fright into him and his administration. After earlier being completely inflexible in the face of the protests, they are now hinting that the referendum on the constitution could be postponed past the December 15 date initially designated by Morsi. Muslim Brotherhood supporters of the president attempted to avoid clashes of the sort that broke out Wednesday, demonstrating in their tens of thousands in the old Islamic quarter in front of the al-Azhar Seminary or at the Rabiah al-Adawiya Mosque in Nasr City not so far from the presidential palace. The liberal political leaders of the National Salvation Front coalition, including Nobel Peace Prize winner Muhammad Elbaradei and the former secretary-general of the Arab League, Amr Moussa, rejected Morsi’s call for a dialogue meeting on Saturday. 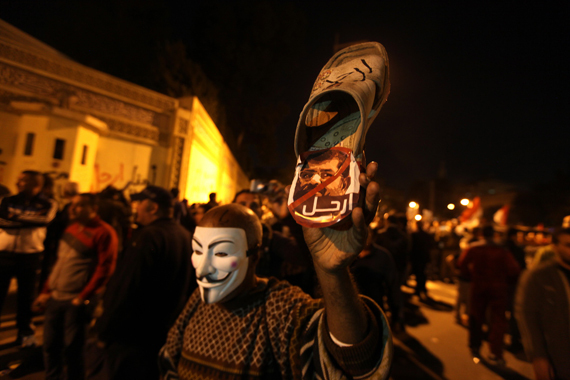 They insisted that Morsi first rescind his decree of Nov. 22 in which he put himself above judicial review. Egypt faces a tough weekend, with a completely polarized public. Aljazeera Arabic is reporting that a few small parties, including The Ghad Party and the liberal Muslim Wasat Party, are saying they are willing to negotiate with Morsi, though their demands remain thesame.